These are not insects, but hard-shelled worm-like creatures in various shades of gray or brown, with many legs. They are often mistaken for WIREWORMS. 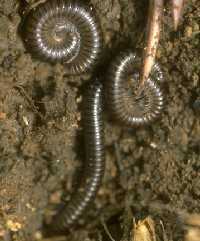 Millipedes are slow moving, usually about an inch and a half long, frequently curling up when disturbed. There are several different species and they are generally considered beneficial, most living on decaying vegetation and manure and a few on insects. But they are known to attack plants on occasion, sometimes feeding on roots, tubers, fruits, seedlings and large seeds and possibly introducing disease pathogens. They prefer dampness, darkness and lots of organic matter. Reducing mulches may help. Although millipedes can be quite damaging on occasion, control is not usually considered to be necessary.